The DWG Viewer is one of the best products you can find out there to view AutoCAD files. Offering a wide array of functionalities, it is free, easy to use and highly effective. Download this software and enjoy tons of great features beyond your imagination! A simple and clear design is what makes this DWG viewer one of a kind. No matter if you want a software for personal or professional use this is the best free DWG viewer for you. So you have to worry if you should download it or not. This tool is for ALL! Not a tech savvy? Well, you don't have to be if you have to use this software. All you need to make use of this program is to have basic computer knowledge. That's all! If you have that you will be able to use this DWG viewer without having to worry about a thing. Other than DWG this freeware offers supports for other formats like DXF and DWF. So you can call it a complete tool for users having such requirements. Other than the diversity it offers great response time, which is pretty impressive. The images do not have to be converted to raster if you have to access them. Save time, save effort by downloading this amazing program! Since the Free DWG Viewer is a standalone app, you don't need to install AutoCAD to use it. In fact, you can downloaded it onto any PC or laptop running Windows OS. Besides, you don't have to worry about any harmful viruses so it does it within no time. As soon as it completes, you will see a guide which will help you get started with ease. The interference of this DWG viewer is very user friendly, which is another plus of this software. You can use all the functionalities in the main menu itself so that is very hassle free and time saving as well. You need to open the files, access them and even print them, if required. The software offers many functions that make accessing the files more effortless. You have the option to choose the zoom in and/or zoom out, rotate, pan and more. You can even customize the colors in them. The DWG Viewer needs low to moderate amount of system resources to complete the job. This is reliable and offers measurement feature as well to enable calibration. You can also add watermarks and export the files to JPEG to enable printing. 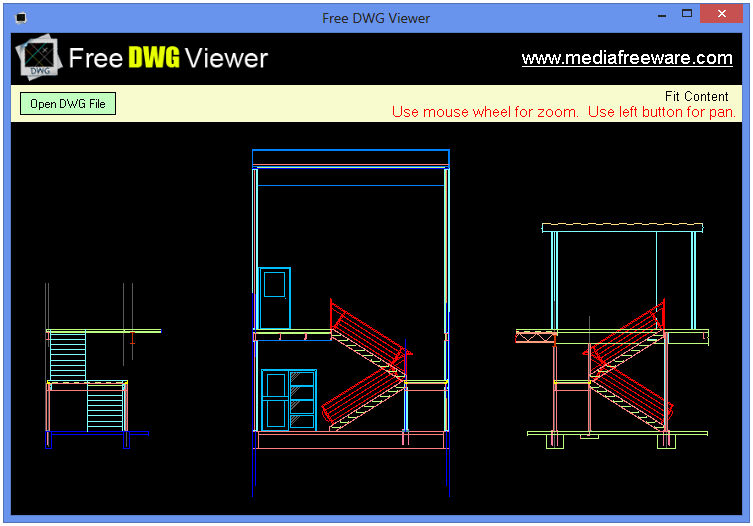 All is all, the best free DWG viewer that you can pick without thinking twice. So download this software and discover an all new way to manage your work now!